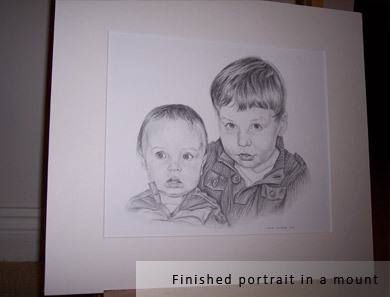 This is a family portrait of two boys that was commissioned as a Christmas present for the family in 2011. 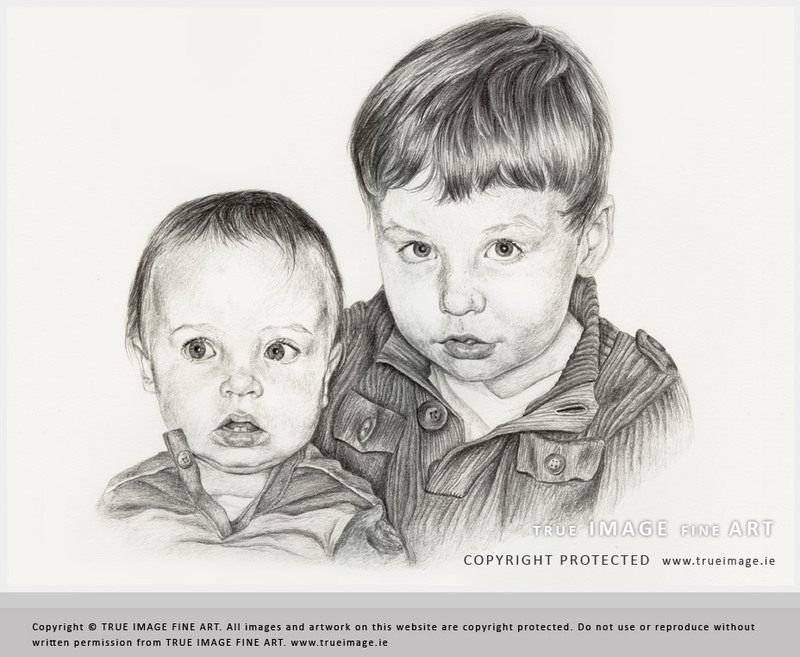 The portrait is drawn with graphite pencils on Fabriano paper and is 30 x 25 cm in size. The drawing was then mounted in an acid free quality mount with backing board and was framed at a later date by the client. Family portraits make great gifts for any occassion and I get a lot of family portrait commissions especially before Christmas. Below is a scan of the final drawing. The scans are of very good quality so clients have the option of getting art prints of their portrait for friends or family. If you require more information on commissioning your own family portrait or have any queries, please do not hesitate to contact me. You can browse the website for more information on family portrait prices or on portrait ordering information. You can also find out about our Terms and Conditions. To protect client privacy, I have not included reference photographs for this portrait. I worked from one photograph with some small adjustments, removing mother's arms and keeping the background white for good contrast. Below are progress photographs that were taken while the family portrait drawing was developing. They were then posted on the Art in Progress Blog to keep my clients informed about the portrait progress. Clients have an option to comment on their portrait and ask me to make adjustments if needed. "It is georgeous, I saw it on your blog. It is a great service you provide....I have just got home and seen the picture - it is beautiful, I am delighted with it. Thank you so much. I know the family will be delighted with it."